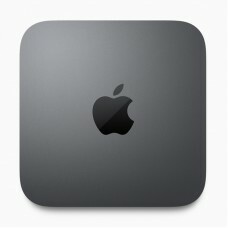 Apple MRTR2ZP/A Core i3 Mac mini PC With Intel Core i3 3.6GHz quad-core,6MB shared L3. It has 8GB of 2666MHz DDR4 SO-DIMM memory,128GB PCIe-based SSD,Intel UHD Graphics 630,Four Thunderbolt 3 (USB-C) ports with support for Two USB 3 ports (up to 5 Gbps),HDMI 2.0 port,Gigabit Ethernet port,3.5 mm headphone jack. Support 802.11ac Wi-Fi wireless networking,IEEE 802.11a/b/g/n compatible,Bluetooth 5.0 wireless technology and 10/100/1000BASE-T Gigabit Ethernet (RJ-45 connector). This mac mini pc Space Gray Color,Weight 2.9 pounds (1.3 kg) and macOS.